Strapped into the small Entry Module for the roller-coaster ride of a lifetime were Soyuz Commander Yuri Malenchenko, now with six space flights under his belt, and Flight Engineers Tim Kopra, returning from his second mission to ISS, and ESA’s Tim Peake who became the first British national to visit the orbiting outpost. 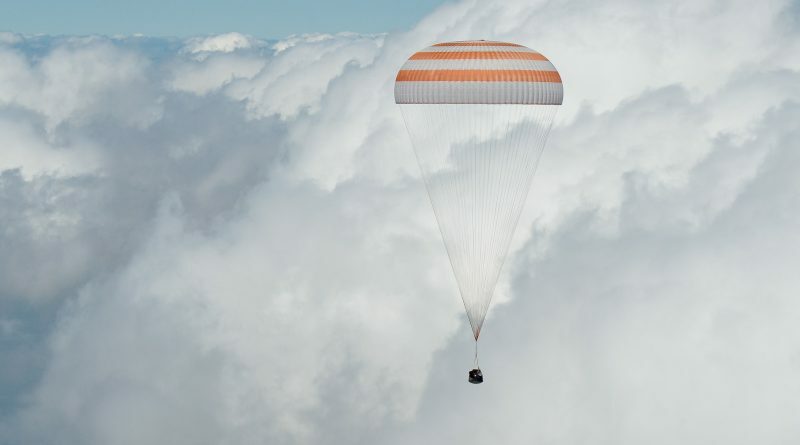 The trio floated into their spacecraft at 2:34 UTC when they closed and locked the hatch to begin the multi-hour setup process for their return. 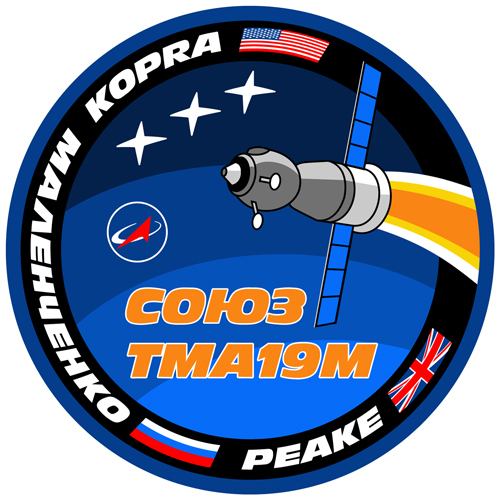 Soyuz TMA-19M made an on-time departure at 05:52 UTC, drifting away from the orbiting laboratory and firing its engines twice to open up a gap before making its deorbit burn. Soyuz hit the brakes at 8:22 UTC when its main engine ignited and successfully dropped the spacecraft out of orbit, heading for a blazing re-entry. Separated from the Orbital and Service Modules, the small Entry Module began feeling the heat when diving into the dense atmosphere. Pulling up for four Gs on their way down, the three crew members received a thorough shaking when the capsule deployed its parachutes to slow down for touchdown. Soyuz made an on-target landing at 9:15 UTC, cushioning its impact by firing Soft Landing Thrusters that kicked up a cloud of dust to signal the crew’s arrival on Terra Firma. All three crew members appeared to be in good physical condition when being helped out of their spacecraft – now set to part ways to begin their post-flight experiment operations. The crew’s 186-day journey began on December 15, 2015 with a thundering liftoff atop a Soyuz FG rocket launching from the Baikonur Cosmodrome on a cold winter day. Lifted into orbit in under nine minutes, the Soyuz executed a flawless expedited rendezvous sequence, arriving in the immediate vicinity of the crew’s destination in space. 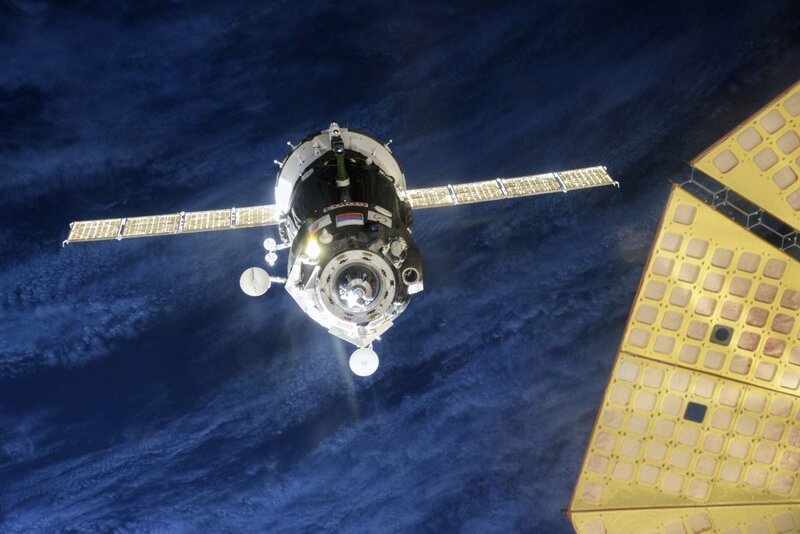 With only a few meters to go, the Soyuz aborted its automated rendezvous and started backing away from the complex, requiring veteran Commander Malenchenko to put his skills to use, bringing the vehicle in for a manual docking to the Rassvet module. Greeted by One-Year Crew Members Scott Kelly and Mikhail Kornienko along with Sergei Volkov, the crew got right to work, their main task being scientific experiments with over 250 active studies during their tenure. The crew’s mission was very busy from the onset as Tim Kopra and Scott Kelly ventured outside the hatches of the Station less than a week after Soyuz docked with Tim Peake taking the important responsibility of suiting the crew up and sending them outside. In their three-and-a-quarter-hour EVA, the crew successfully freed up the Station’s Mobile Transporter that had gotten stuck out on the Station’s truss. 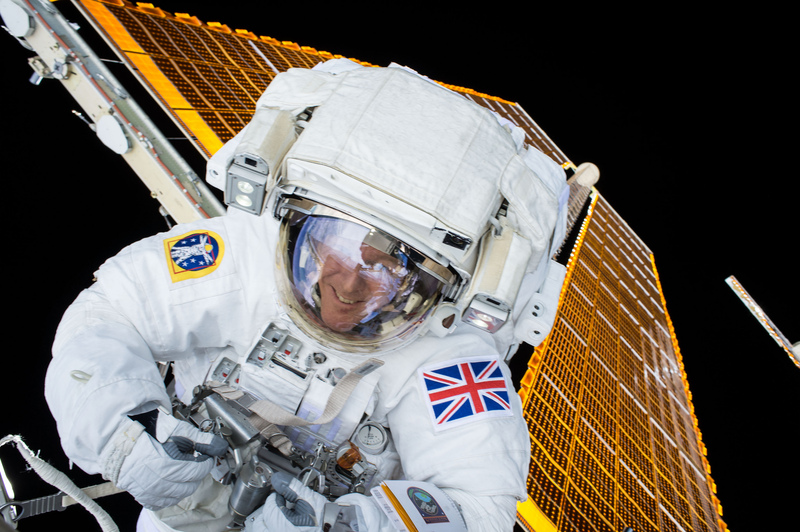 Three weeks later, it was Tim Peake’s turn to venture into the void, together with Tim Kopra, to switch out a faulty power switching unit in an EVA lasting close to five hours and ending with a water-intrusion into Kopra’s helmet that was without danger to the Astronaut due to the quick decision to end the spacewalk. 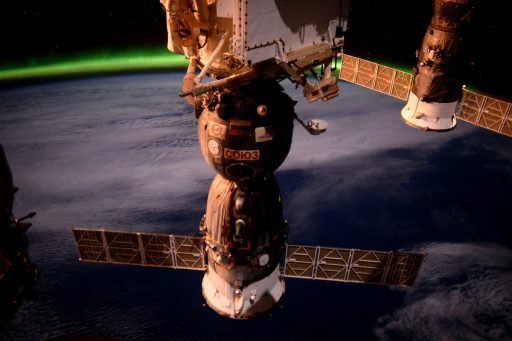 Yuri Malenchenko and Sergei Volkov had an opportunity of working outside the Station, retrieving and installing different scientific experiments on February 3. While the spacewalks are widely watched, they are not representative of the crew’s duties while on ISS. Their daily routine includes a barrage of medical tests and sample collection for various studies investigating how extended exposure to the space environment affects the different systems of the human body. 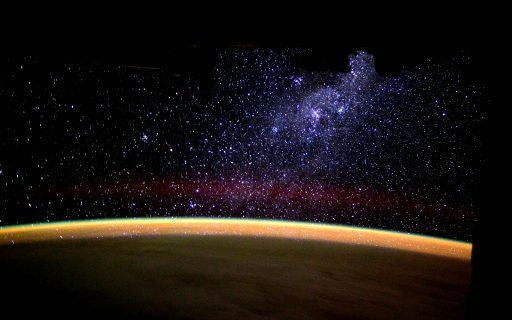 Studies in other fields require a broad set of skills from the crew ranging from gardening in space, over chemistry and physics studies, to dissecting mice in the name of science. Daily tasks also include maintenance on the Station’s systems and a 2.5-hour block of exercise to prevent an excessive loss of bone and muscle mass. The three crew members were also tasked with plenty of logistics – supporting two Progress missions on the Russian side, including the first flight of the modified Progress MS, and two Cygnus and a Dragon mission on the U.S. Segment, delivering tons of cargo to ISS and taking out the trash at the end of their respective missions. 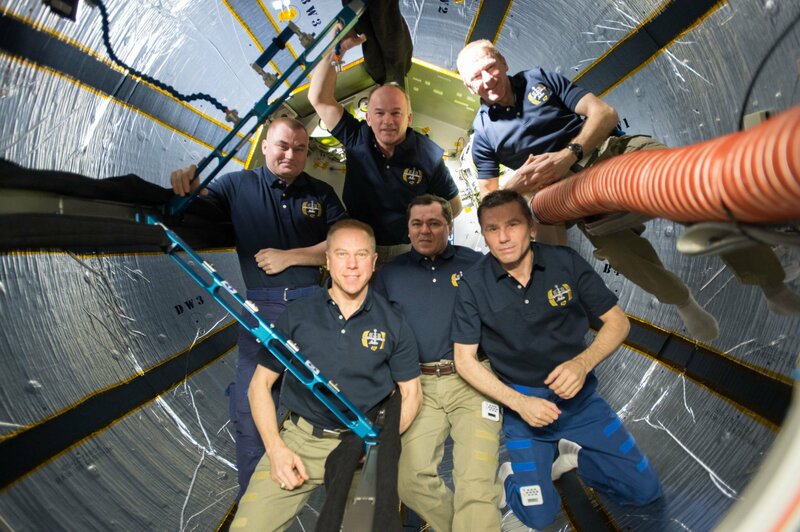 Juggling a busy schedule up in orbit, the crew even managed to stay active on Social Media to share their experience. While Yuri Malenchenko used a blog format on the Roscosmos website for occasional updates, both Tim Kopra and Tim Peake took to Facebook and Twitter on a daily basis to share photos of their views of planet Earth and provide insights into their lives aboard ISS. Tim Peake’s mission was widely watched in the United Kingdom and he made a number of appearances on TV events, but also participated in many educational events with schools around the UK to share his experience and inspire the next generation of space travelers. He also ran the entire London Marathon on one of the Station’s treadmills, finishing the course in just over three and a half hours. 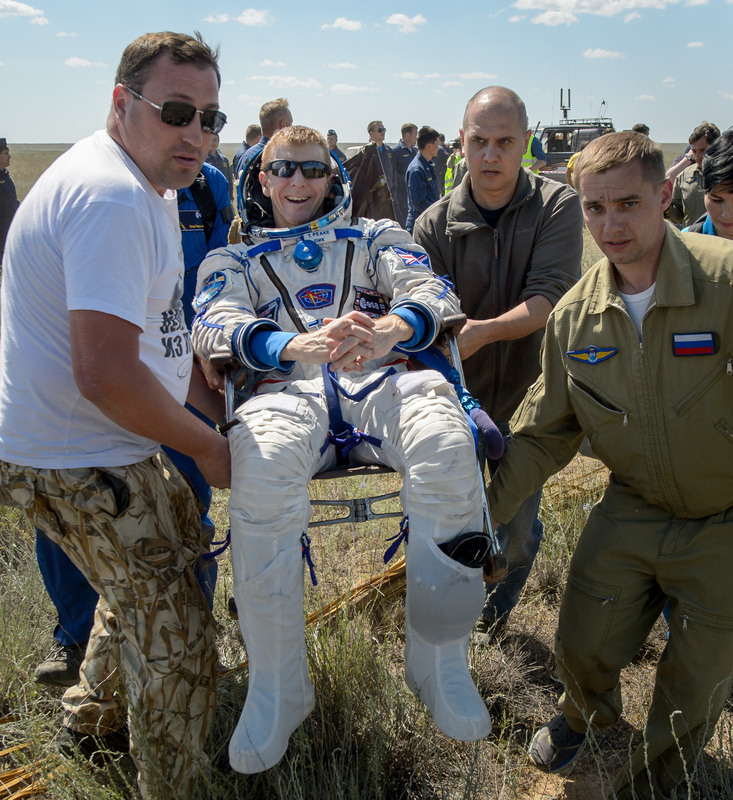 In March, Malenchenko, Kopra and Peake saw off the One-Year crew as they returned to Earth with Sergei Volkov to conclude the longest ISS mission to date, collecting valuable data on the long-term effects of microgravity on the human body. 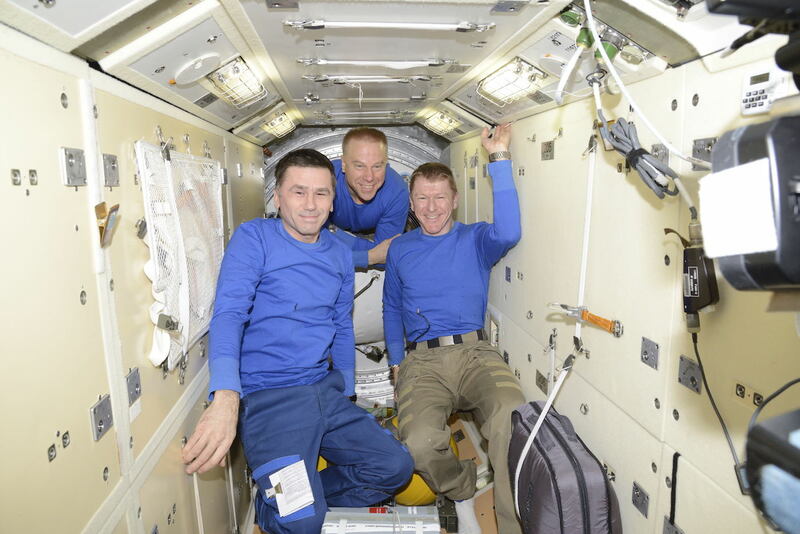 For the three weeks until the next Soyuz launch, ISS was only staffed by the three TMA-19M crew members, keeping ISS in ship shape until Jeff Williams, Aleksey Ovchinin and Oleg Skripochka made it to ISS. Bidding farewell to their colleagues and ISS, the three crew members floated into their Soyuz and closed its hatch early on Saturday, heading into a two-hour process of checking the seal between Soyuz and ISS for leaks and donning their Sokol Launch and Entry Suits before strapping themselves into their seats in the Entry Module. 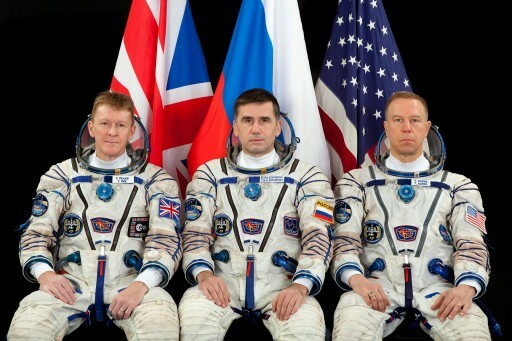 Malenchenko, flanked to his right by Tim Peake and to his left by Tim Kopra, completed a final review of flight parameters via the vehicle’s Digital Control System before enabling the automatic undocking sequence. 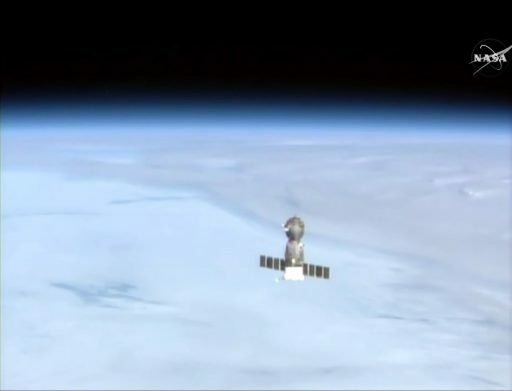 The undocking command initiated the opening of hooks that held the Soyuz in place for half a year and springs pushed the spacecraft away at 5:52:35 UTC, marking the start of the crew’s return journey and the beginning of ISS Expedition 48 under command of Jeff Williams. Soyuz drifted away for three minutes before enabling its thrusters to fire first for an eight-second and then for a 30-second departure burn to rapidly move Soyuz away from the Station. Sitting side by side in the small Entry Module, the crew enjoyed one and a half laps of Free Flight, watching over their spacecraft but also enjoying a few final views of Earth from their orbital vantage point. Soyuz ignited its SKD main propulsion system at 8:22:07 UTC to hit the brakes and place itself on a sub-orbital arc. With a thrust of 300 Kilogram-force, SKD fired towards the direction of travel and reduced the vehicle’s speed by 128 meters per second – putting it on a course to re-entry and setting up the proper entry location and angle. 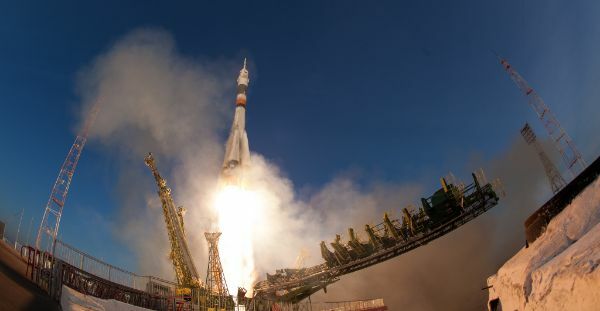 While dropping toward the atmosphere, Soyuz accelerated again to over 7.6 Kilometers per second, firing a series of pyrotechnics when passing 140 Kilometers in altitude to shed its Orbital and Service Modules that were facing a fiery demise upon re-entry. Pulsing its Hydrogen Peroxide Thrusters, the Entry Module swung its heat shield around to face the direction of travel prior to Entry Interface at 8:52 UTC. With temperatures on the heat shield reaching 1,600°C, Soyuz went through a blaze of fire as it was rapidly slowed down in the atmosphere. As an all-pilot crew, the trio on board were well accustomed to encountering high G forces, pulling five Gs when passing through 35 Kilometers in altitude. Soyuz blew its parachute cover at 10.8 Kilometers in altitude and first deployed a pair of Pilot Chutes that pulled out the larger Drogue, violently shaking the spacecraft and its three passengers as the Soyuz slowed from Mach 0.7 at chute opening. 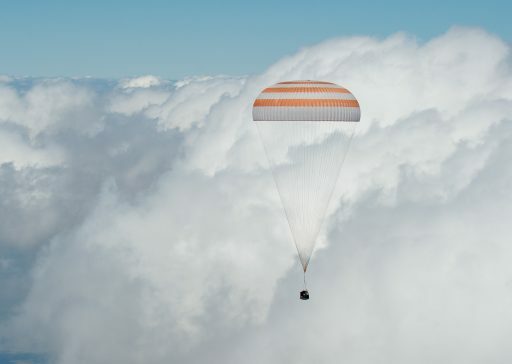 The huge orange-and-white main chute opened 7.5 Kilometers in altitude when Soyuz was already visible from the landing site in a very clear day in south-central Kazakhstan. With the Landing Program up and running, Soyuz dropped its heat shield to expose the landing thrusters and begin taking altimeter data. 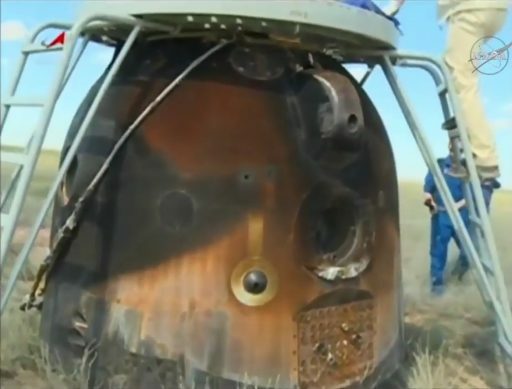 The charred window covers were ejected, Hydrogen Peroxide was vented from the tanks and pressure was equalized while Soyuz calmly swayed in the wind. 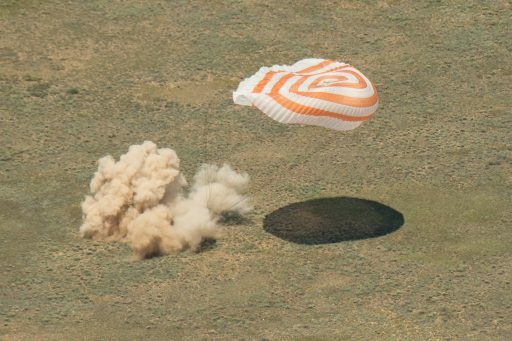 The big finale of a long journey came at 9:15 UTC when Soyuz blasted its Soft Landing Engines to cushion its speed before hitting the ground in a noticeable landing often likened to a small car crash. Soyuz TMA-19M landed in the designated zone 148 Kilometers south-east of the town of Dzhezkazgan and a 300-person recovery team began descending onto the landed Soyuz to extract the crew. Recovery teams were quick to open up the hatch of the Soyuz as it had landed on its side. All three crew members were extracted from the spacecraft and seated in reclining chairs next to their spacecraft, all appearing to be in good physical condition and happy to be back on Earth. Yuri Malenchenko adds 186 days to an impressive career record, having now spent 827.4 days in space aboard the Mir and ISS Space Stations, the Russian Soyuz and the U.S. Space Shuttle over a career of almost 30 years. Malenchenko now ranks second on the all-time list for career time in space, only falling short of Gennady Padalka who spent 879 days in orbit. 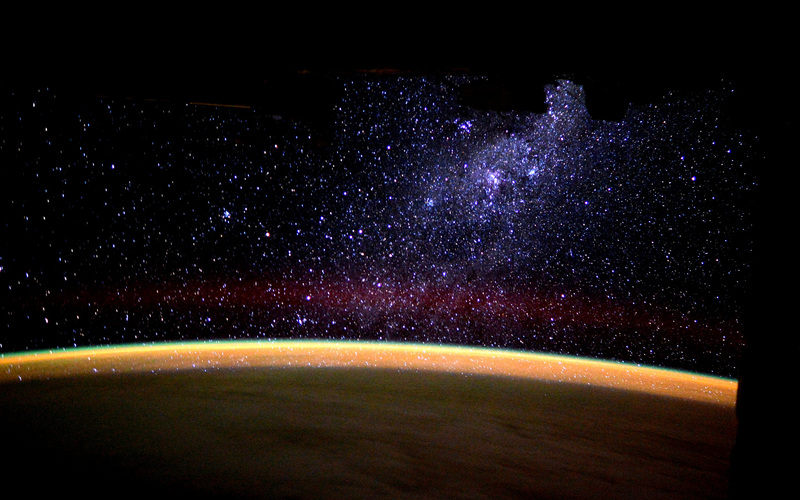 Tim Kopra has now logged 244 days in space on two missions and Tim Peake’s total stands at 186 Days. Having spent a few minutes next to their Soyuz, the crew was moved to the Medical Tent for initial check-ups before they can depart the landing site. 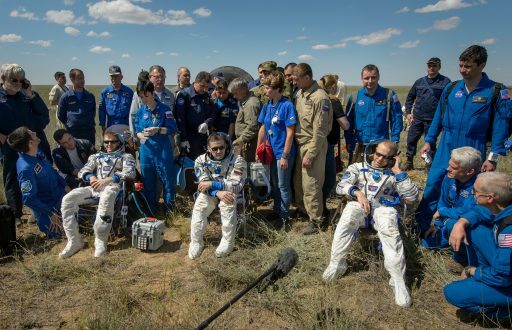 The crew will part ways for the first time in over half a year after a short welcoming ceremony in Karaganda as Yuri Malenchenko heads to Moscow and the two Tims initially share a NASA plane. Tim Peake will switch planes in Norway to fly to a German Aerospace Center facility in Cologne for his post-flight operations while Tim Kopra heads to NASA’s Johnson Space Center in Houston. With the crew back on the ground safely, focus on ISS shifts to three weeks of operations as a crew of three, awaiting the arrival of the Expedition 48/49 crew. Soyuz commander Anatoli Ivanishin and Flight Engineers Kate Rubins and Takuya Onishi are looking forward to liftoff on July 7 at around 1:36 UTC. This will be the first flight of the new Soyuz MS vehicle featuring a number of systems improvements in what likely is the last generation of Soyuz spacecraft, flying until the end of the Space Station Program.